It was a filling meal and made my taste buds very happy. Low carb and delicious flavor…a perfect combination! I had gestational diabetes when pregnant with my son Billy. Now, 12 years later, I am considered by my doctor to be “pre-diabetic”. As such, I’ve had to learn to eat more carefully and to hugely reduce my carbohydrate intake. This meal was perfect and my blood sugars were just right two hours after consumption! That makes the meal even better in my opinion. Enjoy! Mix the first three ingredients in a bowl. Peel and press all of the garlic cloves in the head (yes it is true, an entire head of garlic-don’t be afraid because it just works) into the bowl. Toast the sesame seeds in a dry pan and add to the marinade. Place aluminum foil loosely across a baking sheet or pan and spray with Pam. This makes clean-up easier and prevents the marinade from running off. Place fish skin side down on the foil. Pour marinade over the fish and let sit for 30 minutes. 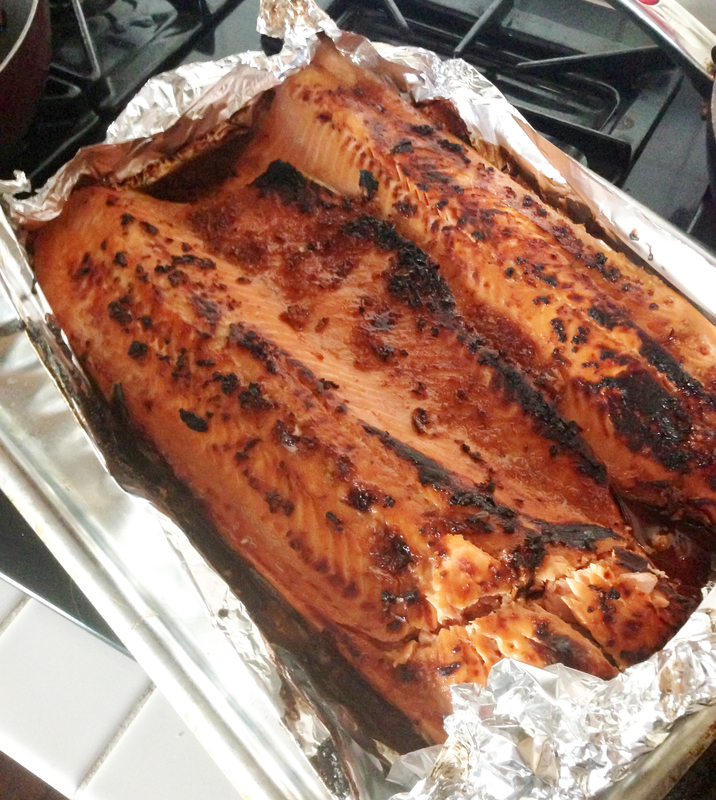 Broil the salmon for 10-15 minutes or until it is flakey and still moist. You don’t even need to turn the fish over because the bottom is skin and it just cooks through perfectly. Cook bacon in a skillet until crisp. Transfer bacon to a paper towel-lined plate. Combine peas, cheddar and scallions in a bowl. Whisk together mayonnaise, lemon juice and Dijon and stir into pea mixture. Season salad with salt and pepper. Stir in bacon right before serving. The marinade sounds great. I’m going to use it for some Tofu.